Put in the sugar and cream, and when this becomes hot put in the chocolate, broken up into fine pieces. Stir vigorously and constantly. Put in butter when it begins to boil. Stir until it creams when beaten on a saucer. Then remove and beat until quite cool and pour into buttered tins. When cold, but in diamond-shaped pieces. 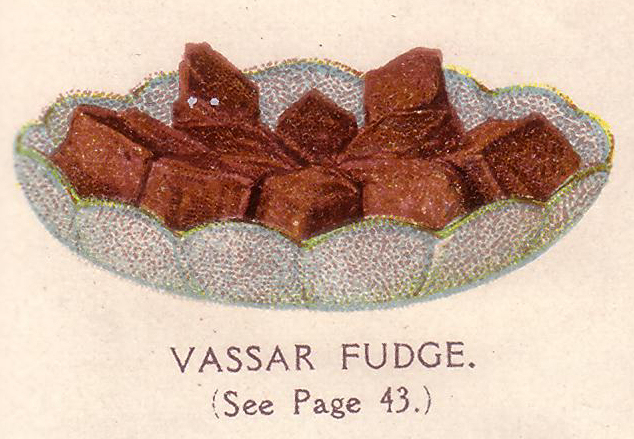 Unfortunately I’m not quite sure what the recipe means by “until it creams when beaten on a saucer.” Vassar was founded in 1861; it was one of the “Seven Sisters” of the Ivy League colleges, and didn’t become coed until 1969. Melt one-quarter cup of butter. Mix together in a separate dish one cup of white sugar, one cup of brown sugar, one-quarter cup of molasses and one-half cup of cream. Add this to the butter, and after it has been brought to a boil continue boiling for two and one-half minutes, stirring rapidly. Then add two squares of Baker’s Premium No. 1 Chocolate, scraped fine. Boil this five minutes, stirring it first rapidly, and then more slowly towards the end. After it has been taken from the fire, add one and one-half teaspoonfuls of vanilla. Then stir constantly until the mass thickens. Pour into buttered pan and set in a cool place. Smith College, opened in 1875, was also one of the Seven Sisters, and is still a women-only institution. I’m intrigued by this recipe’s precise timing directions. Heat two cups of granulated sugar and one cup of rich milk (cream is better). Add two squares of Baker’s Premium No. 1 Chocolate, and boil until it hardens in cold water. Just before it is done add a small piece of butter, then begin to stir in marshmallows, crushing and beating them with a spoon. Continue to stir in marshmallows, after the fudge has been taken from the fire, until half a pound has been stirred into the fudge. Cool in sheets three-quarters of an inch thick, and cut in cubes. Wellesley College is, yes, another of the Seven Sisters. It also opened in 1875 and is still women-only. In fact, only Vassar and Radcliffe (which merged with Harvard) have abandoned the notion of separate colleges for women. 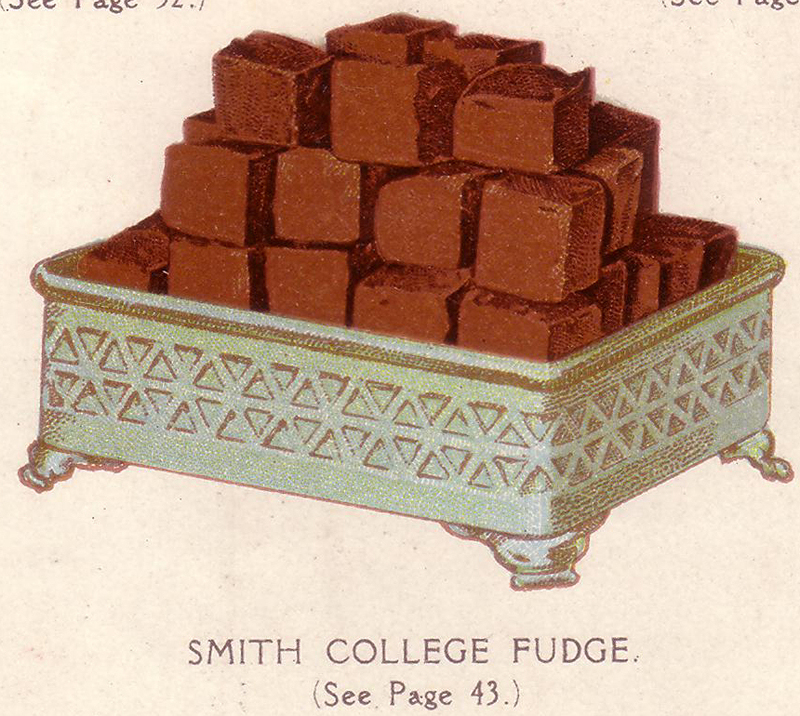 Wellesley is also credited with recipes for cake and frosting, in the section contributed by Fannie Merritt Farmer, also of Boston Cooking School fame. Cream butter and add sugar gradually, while beating constantly; then add yolks of eggs beaten until thick, milk, and flour mixed and sifted with baking powder. Add whites of eggs, beaten until stiff, chocolate (melted over hot water) and vanilla. Turn into a buttered and floured shallow cake pan, and bake in a moderate oven from thirty-five to forty minutes. Remove from pan, cover top with Wellesley frosting and when frosting is set pour over, a little at a time, two squares Walter Baker & Co.’s Premium No. 1 Chocolate (which has been melted over hot water) and spread evenly, using the back of a spoon. Why the call it a “loaf cake” when it’s baked in a cake pan, I don’t know. Maybe because it doesn’t specify a round cake pan, or layers? Put sugar and water in saucepan, stir until sugar has dissolved. Bring to boiling point and let boil vigorously, without stirring, until syrup will thread when dropped from top of spoon. Put whites of eggs in saucepan and beat until stiff. Pour on the syrup gradually, while beating constantly, and continue the beating, until mixture is nearly stiff enough to spread. Place saucepan containing mixture in a larger saucepan, containing a small quantity of boiling water, place on range and cook, stirring constantly (scraping from bottom and sides of pan) until mixture becomes granular around sides of pan. Remove from saucepan of hot water, and beat until mixture will hold its shape; then add vanilla. Pour on cake and spread evenly, using a knife. This is one of the varieties of thick, soft frostings which has recently met with so much favor. That frosting recipe makes me tired just reading it, but it would almost have to be good after all that effort, wouldn’t it?